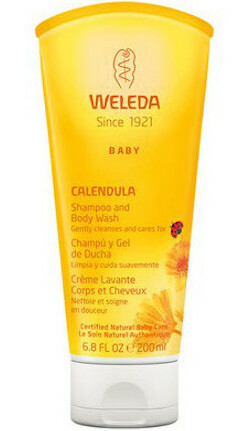 Formulated with the mildest organic and natural plant-based cleansers, Weleda Calendula Shampoo and Body Wash is a gentle wash that retains the moisture in your baby's hair and skin, leaving it feeling silky smooth and protected from drying out. Organic calendula flower extract soothes and softens your baby's hair and skin, while organic sesame seed oil absorbs fast and easily to keep your baby's skin and hair from losing precious moisture. Ingredients: Water (Aqua), Coco-Glucoside, Prunus Amygdalus Dulcis (Sweet Almond) Oil, Alcohol, Disodium Cocoyl Glutamate, Sesamum Indicum (Sesame) Seed Oil, Glycerin, Carrageenan (Chondrus Crispus) Extract, Sodium Cocoyl Glutamate (Sodium Cocoyl Glutamate), Calendula Officinalis (Calendula) Flower Extract, Xanthan Gum, Lactic Acid, Fragrance (Parfum), Limonene, Linalool. Fragrance from natural essential oils.